While it may take a short few seconds at the doctor’s office, monitoring your own blood pressure at home makes it far more convenient. High blood pressure usually occurs without symptoms, and it is a contributing cause of death for over 360,000 Americans each year. If age or other risk factors make frequent blood pressure checks necessary for you, it’s important to understand the differences between the many monitors/cuffs on the market. Even more so, it’s important to figure out your specific needs and find the model that’s right for you. Highly rated yet affordable, the Omron 5 Series is a high-quality monitor with an eye for value. Despite an abundance of features, it comes at a significantly lower price than competitors with similar options. Blood pressure is displayed as the average of three separate measurements. Works with 2 separate users- stores 50 measurements per user. Notifies user if an irregular heartbeat is detected. Compares blood pressure readings to a “BP level bar” that represents a healthy individual. A few instances of inaccurate measurements have been reported. Contoured “Wide-Range” cuff makes measurements more comfortable, and fits medium to large adult arms (9-17”). 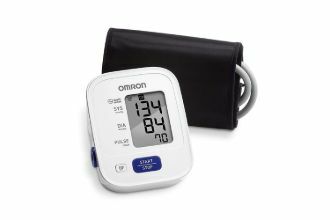 The Omron 3 Series is hard to beat as a budget BP monitor- it offers several of the features of other Omron models, all for a very reasonable price. 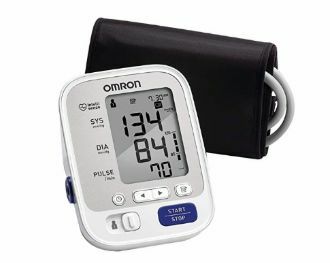 The Omron 3 Series blood pressure monitor features a very reasonable price. Alerts the user if irregular heartbeats are detected during BP measurement. This model blends the convenience of an at-home blood pressure monitor with a simple and compact wrist-mounted display. Monitor and cuff are combined into one device for easy use. 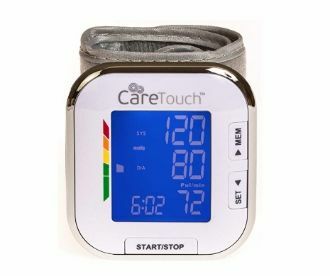 The Care Touch wrist blood pressure monitor is comfortable and convenient. Per instruction manual, wrist mount requires that the user lie in a precise position for accurate readings. 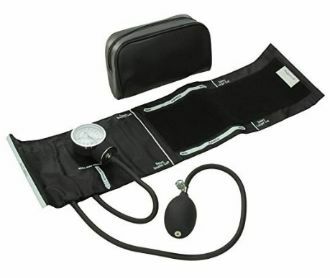 If you are comfortable with your ability to take your own blood pressure manually, the SantaMedical Manual BP cuff is both extremely accurate and extremely affordable. Among manual blood pressure cuffs (also known as sphygmomanometers), SantaMedical offers a superior choice. The Santamedical manual blood pressure cuff doesn't require batteries. Lack of digital features make this monitor affordable, plus no electricity is required. Blood pressure readings are highly accurate. High contrast dial is easy to read. With multiple smart features that allow for smartphone linking, the Omron 10 Series is an advanced wireless model that can fulfill almost every need. Given its large array of features, which include Bluetooth, it is one of the most complete models on the market, and it is priced accordingly. The Omron 10 Series can help you keep track of your heart health using the free Omron Connect app. Links to the Omron app on iOS and Android, which can store unlimited BP readings. Automatically compares readings to a healthy adult standard. Some issues with longevity have been reported. Monitoring your own blood pressure at home is an important task, but the right equipment can make it a lot easier. The Omron 5 Series has the best cost to benefit value of all the models we reviewed. The Omron 3 Series keeps the essential features at a lower price point. Care Touch offers a wrist mounted device that combines monitor and cuff into one compact package. If you can get by without digital memory and automatic readings, SantaMedical provides an extremely affordable manual monitor that will give you the accurate readings you need. 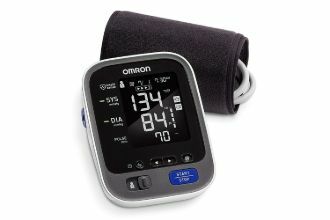 On the other end of the spectrum, Omron also offers a smart BP monitor. Although it comes at a higher price, it has all of Omron’s best features, and it can connect to smartphones for unlimited storage. Whether you’re concerned about price, or storage, or accuracy of your blood pressure readings, there exists a combination that is right for you. “High Blood Pressure (Hypertension).” Mayo Clinic, Mayo Foundation for Medical Education and Research, 12 May 2018, www.mayoclinic.org/diseases-conditions/high-blood-pressure/symptoms-causes/syc-20373410.